Considering airflow is the most important feature of any furnace vent screen, we’re not surprised that many manufacturers and retailers fail to disclose their vent screen’s airflow rating. The reason why they do this is simple, and that’s because the vast majority of vent protection products have a poor airflow rating. Poor flowing vent screens are not only unsuitable and potentially unsafe for use in sub-freezing temperatures, but they are largely ineffective against insect infiltration events in warmer temperatures. To add insult to injury, many of these same manufacturers don’t even provide instructions on how to use their vent protection products. Because of these omissions, and our desire to help consumers better understand the important features of any vent protection product, we have posted this furnace vent protection best practices page. While there is a lot of information packed into this single page, its importance can’t be understated. 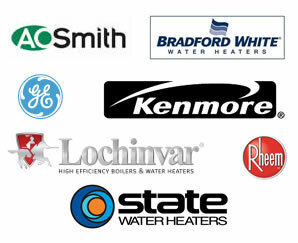 A furnace, just as a boiler and hot water heater, uses combustion to produce heat. A byproduct of combustion is carbon monoxide. Restricting too much fresh air from the intake and exhaust discharge may not only decrease the furnace’s energy efficiency, but can also cause a substantial and unsafe rise in CO.
For most consumers, a single vent screen will not provide adequate vent protection in all seasons. Rodent screens have a wider open area, which will not prevent bees and wasps from entering a furnace’s intake and/or exhaust pipe during spring, summer and fall. In fact, many rodent screens provide a safe barrier for bees and wasps to build their nests behind of like the nest in the picture to the right. Insect screens, on the other hand, have a close mesh that is not suitable for use during winter. Since seasonal threats to ventilation systems must be balanced with the needs of the furnace, we sell all-season vent screen kits in our store to provide year-round protection. These kits include our popular PVS-RS series vent screen (90% airflow) for use during winter and our PVS-IS series vent screen (70% airflow) for use during spring, summer and fall. You may be surprised to know, but the PVS-IS series vent screen actually has a better airflow rating than many rodent screens sold on the market. As noted previously, the most important feature of a vent screen is its airflow. Particularly in sub-freezing temperatures, a vent screen’s baseline airflow is reduced when cold dense air has a more difficult time being drawn in by the intake vent and moisture in the exhaust vent’s air collects on the screen and freezes. Those shopping for a vent screen will find that few manufacturers or retailers disclose the airflow rating of their products. There’s a reason why these manufacturers don’t want consumers to know the airflow rating of their products, and that’s because they don’t want consumers to know how restrictive they are. Unfortunately many consumers don’t bother to ask or investigate what a vent screen’s airflow rating is, and that often comes back to bite them as temperatures drop. It’s quite common for HVAC technicians to respond to furnace lockout calls and remove frosted over and iced over exhaust vent screens that are preventing the furnace from operating. In fact, furnace exhaust vent screen icing can be so severe on already restrictive vent screens that the entire vent termination hub must be sawed off and replaced. However, just because a furnace operates does not mean restrictive vent screens have no impact on the appliance or the safety of those inside the dwelling. As an exhaust vent screen ices over, increased levels of CO may be observed inside the furnace cabinet. The ANSI Z21.47 specification requires that no more than 400 PPM (parts per million) of CO be present in an operating furnace, and vent screen icing does contribute to elevated CO levels inside the furnace cabinet by restricting the exhaust discharge. To put this into perspective, the EPA indoor air quality report recommends exposure of no more than 25-45 PPM of CO in an eight hour period. Because of this, consumers are wise to determine the base airflow rating of any vent screen they may purchase and how it may impact the combustion process. Using the wrong vent screen, especially in sub-freezing temperatures, can have the same impact on the combustion process as if an animal were lodged inside a ventilation pipe. Because of this, in sub-freezing temperatures we recommend that no less than a 90% airflow rated screen be used on both intake and exhaust vents for 90%+ efficiency appliances. As we noted in the paragraph above, a furnace vent screen’s airflow during winter is very important. Generally speaking, any vent screen that is strong enough to hold its form inside a vent termination hub is too restrictive for use during winter. Having thick wires, more wires or a weave pattern gives condensate additional surface area to collect and freeze on. Vent screens being sold that meet this criteria tend to include vent screen discs or what we in the industry refer to as glorified vent screen discs, which are simply discs preinstalled in a piece of PVC pipe. Since vent screen discs are relatively inexpensive, consumers are understandably drawn to their bargain price. However, that initial value is quickly lost as the result of increased energy consumption, increased CO accumulations within the home and/or furnace lockouts requiring an emergency service call. Since ice related problems become progressively worse as temperatures drop, consumers are wise to avoid these types of vent screens entirely, remove them prior to winter if they are presently installed in their furnace’s intake and/or exhaust vent termination hubs and upgrade to a better flowing vent screen for use during winter. When purchasing any vent screen for use during winter, it is extremely important to determine its airflow rating. While some vent screen manufacturers and retailers claim their vent screens provide maximum airflow, most don’t advertise the airflow as a percentage. In fact, most steel vent screens have an airflow rating of 74% or less and are unsuitable for use during winter. PVS-RS series vent screens, on the other hand, have a 90% airflow rating and are specifically designed to protect furnace vents in sub-freezing temperatures and throughout winter on ventilation systems operating in the coldest climates of North America. Since insects are not active, the primary purpose of PVS-RS series vent screens is to guard furnace vents from debris and rodents such as birds, chipmunks (ground squirrels), mice, squirrels and other animals. Since a mouse needs the opening the size of a nickel to squeeze through, we don’t restrict openings much beyond what is necessary to keep mice and larger animals outside. In fact, PVS-RS series vent screens will not allow a dime through the openings yet still maintains a 90% airflow rating. Please view Fairfax County Health Department’s controlling rats and mice PDF brochure (opens in new window) for additional details about protecting homes from mice and rats. While PVS-RS series vent screens may be used in all seasons, many of our customers use them during winter and use PVS-IS series vent screens in the other seasons when insects are active. For those that use PVS-IS series vent screens, we recommend replacing them with the PVS-RS series vent screen after the first hard frost and leaving it in until spring arrives. 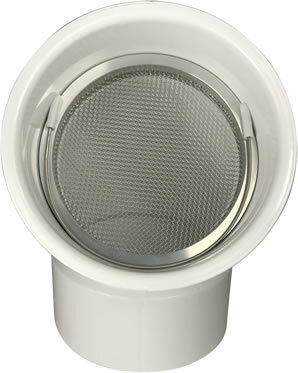 The PVS-RS2 and PVS-RS3 vent screens are commonly used for residential furnace venting applications. Since condensate freezing on screen wires is not a concern in above freezing temperatures, a close mesh vent screen may be used to protect vents when insects are active. Generally referred to as three season screens, PVS-IS series vent screens allow high efficiency furnaces to operate normally in above freezing temperatures while keeping bugs outside where they belong. Bees and wasps are known to build nests within intake and exhaust pipes, which create restrictions that can be costly to repair. Active nests, sometimes within the furnace cabinet itself, can be quite costly to resolve and often require service calls from both a licensed pest control specialist and HVAC technician. PVS-IS series vent screens utilize a 316 stainless steel 18×18 mesh, which has slightly smaller openings than the average window screen. PVS-IS series vent screens have a 70% rate of airflow and maintains the strength needed to also prevent intrusion from animals. We recommend installing the PVS-IS series vent screen in spring, when future temperatures are forecast to be above 32°F, until the PVS-RS series vent screen is to be installed after the first hard frost. 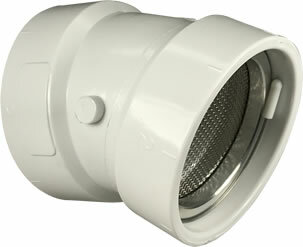 The PVS-IS2 and PVS-IS3 vent screens are commonly used in residential furnace venting applications. 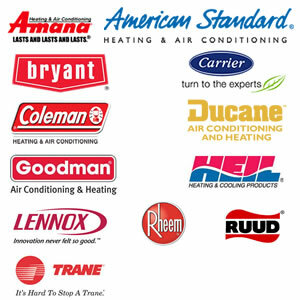 The average lifespan of a new furnace is 15 years. Shouldn’t the vent screens that protect the furnace’s intake and exhaust terminations also have an equivalent lifespan as well? PVS series vent screens are what we consider a professional grade product. Besides having the airflow ratings HVAC engineers require for critical projects, PVS series vent screens are also made of the highest quality materials to ensure durability. PVS series vent screens utilize 316 stainless steel screens, which are far more durable than 304, 302 and galvanized steels. Especially on a furnace’s exhaust vent, which discharges acidic vapors, a 316 stainless steel screen will not corrode and provides for many years of service under normal operating conditions. The 6061-T6 aluminum shell, encasing the 316 stainless steel screen, also resists corrosion and is precision machined for a slip fit installation. 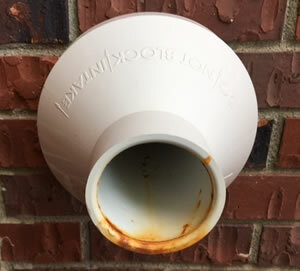 When purchasing a vent screen, consumers should be aware that many screens utilize inferior steels that will corrode and permanently stain PVC like the concentric vent pictured to the left. Especially with vent screen discs, corrosion often causes them to fall out of the termination hub to the ground where they become a sharp hazard to those that may unknowingly step on the screen. As you will see in the image to the right, PVS series vent screens are designed to install inside a furnace’s intake and exhaust vent termination hub. Vent screens that install around the outside of the vent termination hub, or extend beyond it, are prone to collecting debris and are directly exposed to precipitation. Additionally, many vent screens available in the marketplace require tools, screws or adhesives for installation. Using these methods to secure a vent screen in place can permanently alter the vent termination hub and should be avoided. 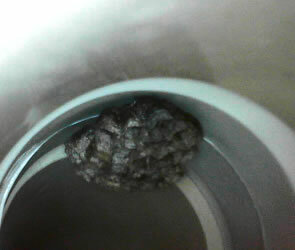 Especially with vent screens that are cement welded in place, the only way to remove them is to cutoff the hub. Other vent screens, which install with a press fit, often scrape the interior of the vent termination hub and can be difficult to remove. 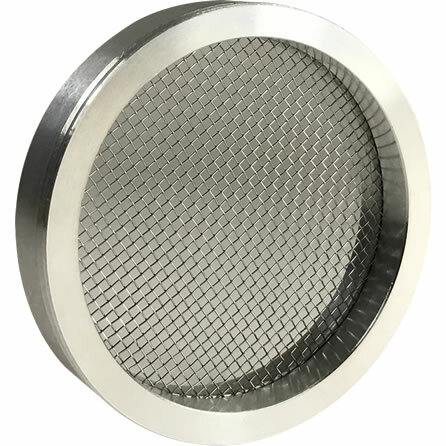 PVS series vent screens, on the other hand, install inside the vent termination hub with a slip fit and utilize an included internal wire clip to secure the vent screen in place. 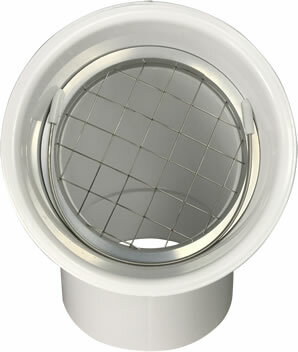 When installed inside the hub, PVS series vent screens remain hidden and serviceable. Especially for those that use the PVS-IS and PVS-RS series vent screens for all-season vent protection, having the ability to easily change screens is necessary. Without any tools, the internal wire clip may be installed and removed in a matter of seconds. Every PVS series vent screen sold includes one internal wire clip, and this internal wire clip may be reused for many years. As is demonstrated on this page, vent screens can have an impact on a furnace’s combustion process as every vent screen will create some degree of a restriction. It’s our hope that the information on this page helps consumers better understand the importance of airflow and how to balance the needs of their furnace with correct vent protection techniques. Should you have any additional product related questions not addressed on this page, we encourage you to visit our frequently asked questions page. Assistance with sizing is available on our vent screen sizing page and includes video.